In late fall, the mid-afternoon sun on northern San Diego County’s coastline is perfect. It glimmers off the waves in California celebration, and together with a soft onshore wind this living postcard has been enjoyed just like this for generations. Taking it all in is 82-year old Vic Wilson and wife of nearly 50 years Betty Jean. 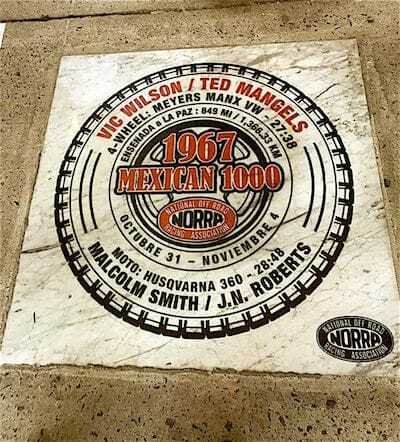 Now in the fall of his life, the overall winner of the inaugural 1967 NORRA Mexican 1000 still does not take it all for granted. The surrounding scenery has changed, but not the magic. The occasion is a seaside lunch at the start of this week’s golden anniversary BFGoodrich Tires SCORE Baja 1000. Quiet, somewhat reserved and gifted with a physical presence that belies his age, Wilson doesn’t live in the past. Today, however, he is content spending a few hours revisiting his role in motorsports history away from the hype and spotlight about to take place at the race’s traditional starting location of Ensenada — just a three hour drive to the south. The passing of time and the perfect setting begged an obvious opening question. Does 50 years ago seem like a lifetime ago or like yesterday? I ask. In the fall of 1967 Vic Wilson had sold his service station on the Pacific Coast Highway before landing a job as sales manager of B.F. Meyers Inc., the company founded by off-road artisan Bruce Meyers. 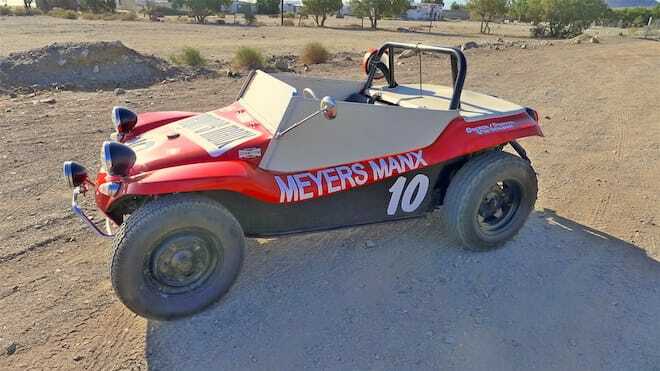 Only three years before, Meyers had sculpted the ultimate California beach car out of fiberglass — the original “Old Red” Meyers Manx dune buggy. The notion of shortening an existing Volkswagen pan, drivetrain and suspension, bolting on one of Meyer’s colorful bodies and living out a Beach Boys song took hold to home garage mechanics across the country, then across the world. In April of that year, Meyers and old buddy Ted Mangels had used “Old Red” to set a new trans-Baja record from La Paz to Tijuana of 34 hours, 45 minutes, beating the time set by several motorcycle records — essentially setting the stage for the National Off Road Racing Association (NORRA) to be formed by President Ed Pearlman and a host of other early off-road pioneers. Their primary mission was to create and promote the world’s first professional off-road race down the Baja peninsula in October of that year — the NORRA Mexican 1000 Rally. 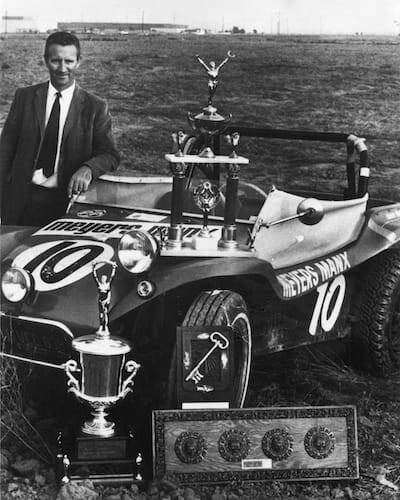 Hoping to use the race to help sell more fiberglass dune buggy kits, Meyers assembled a three-car team of Meyers Manx for that inaugural race, one of them for he and “Wheelo” Anderson, one for the team of George Haddock and Jimmy Smith and a third — the red No.10 buggy for Wilson and Mangles, who would later use his mechanical genius as an engineer for the Cal Well Jr./PPI Toyota factory off-road race team led by Ivan “Ironman” Stewart. A total of 68 teams arrived to compete in that first Mexican 1000. As they gathered at the seaside bullring in Tijuana for the start the asphalt was littered with a menagerie of Jeeps, trucks, motorcycles and cars, including a Triumph TR-3 and a Citroen 195. To Wilson, his approach to the inaugural Mexican 1000 wasn’t as a race at all. “To me, it was like a Jeep club outing that was at the heart of my off-road background,” he says. “For Bruce, it was a race because he had a vested interest. He and Ted had just set the four-wheel record a few months before and we all set out to break that record again,” said Wilson. The first Mexican 1000 was an eye-opener for most, as a majority of racer had little idea of what they were facing or where they were going. With Baja veteran Mangels (below) at his side, Wilson headed south at a steady but conservative clip, eventually outgunning a the motorcycle team of J.N. 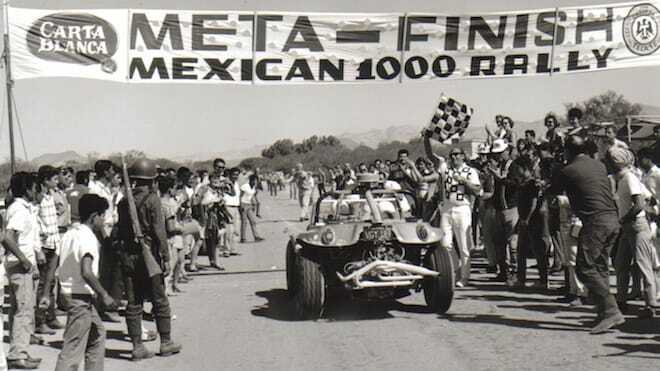 Roberts and Malcolm Smith down the highway to La Paz and taking the Mexican/Baja 1000’s first checkered flag. “I was behind the wheel for 25 hours, and the things I saw at night that were never, ever there — all hallucinations. That’s what I really remember. We didn’t have the lighting capability so we couldn’t really see, even at a top speed of 67 miles an hour,” he chuckled. Wilson and Mangel’s time of 27 hours, 38 minutes shattered all existing records and set a benchmark for the event’s future. Wilson would return the following year as part of the Meyers Manx factory effort; this time in one of the company’s newly launched “Tow’d” tube frame cars painted, not surprisingly, like a green frog skin. This time, 33 year-old Wilson and co-driver Jeff Jahns broke a wheel but still managed to finish in the top five. Meyers, on the other hand, suffered a huge crash that effectively ended his racing career. 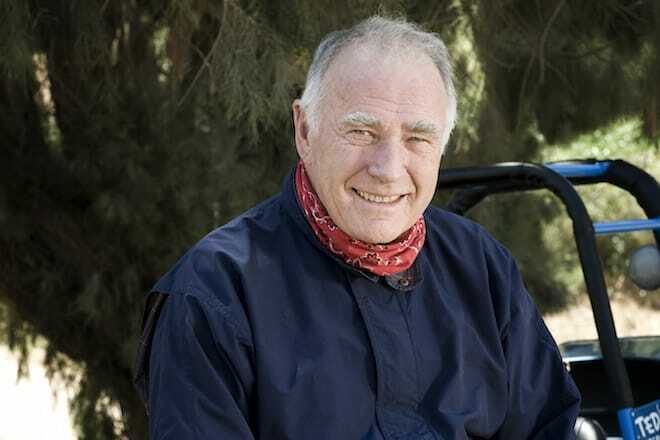 Then firmly entrenched in building and promoting his huge Saddleback off-road park in Orange County, California, Wilson would return to the Mexican 1000 winners circle again in 1970, taking the race’s overall win in an overall clocking of just over 16 hours driving Drino Miller’s (later of Toyota/TRD fame) radical single-seat VW-powered tube frame buggy. Sponsored by Betty Jean’s Dune Buggies & Hot VWs magazine, the effort was a potent combination that would also earn the trio overall wins at the Mint 400 and Baja 500 the next season. “The biggest thing I remember from that second Baja win was despite the fact the car wasn’t really that sophisticated — it still had a Volkswagen engine and suspension — was how fast things had become. It took us 11 hours less to run the same distance that second time. 11 hours less in just four years. That’s a huge move. The Mexican 1000 had gone from an adventure to a race. Now, 50 years after taking the checkered flag in off-road racing’s most significant milestone, time has not taken away his sense of pride for all those who have followed in his tire tracks. But when asked to compare those times to today, Wilson’s answer is perhaps not surprising at all.